The desire to create 'dynamic surfaces' probably arose out of some haptic, kinesthetic sensibility. This might be in strong contrast to employing a technical, mathematical route of exploration, in attempting to grasp and visualise the evasive complex forms. The attempt to acquaint myself with the mathematical language has not been an easy process but a very rewarding one. Initially the forms were inspired by a series of diagrams that are similar to three-dimensional 'Lissajous's curves', that arise from an interaction of simple harmonic motions. 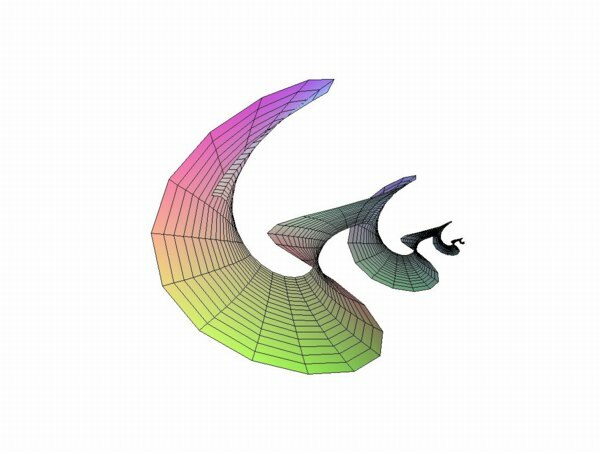 Though not intrinsically three-dimensional, the same principles could be simulated mathematically in three dimensions and the resulting figures were expected to help in the visualisation of complex curvature transitions in the desired forms. Secondly, the global, dynamic principles further related to the behaviour of dynamical systems as it is investigated in physics. The mathematical principles are very different and the visual plottings from this domain are more abstract in nature. Only in certain cases can they be compared to actual surfaces. Nevertheless, the plots give some insight into the possible dynamic continuity of three-dimensional curves or surfaces. These will be dealt with on the Dynamics page. The most practical benefit was expected to come from the investigation of minimal surfaces, which have been of particular interest to mathematicians in the areas of differential geometry and topology. Non-plane minimal surfaces are broadly speaking identical to anticlastic surfaces, and a familiarisation with the related geometrical vocabulary promised to be very useful. 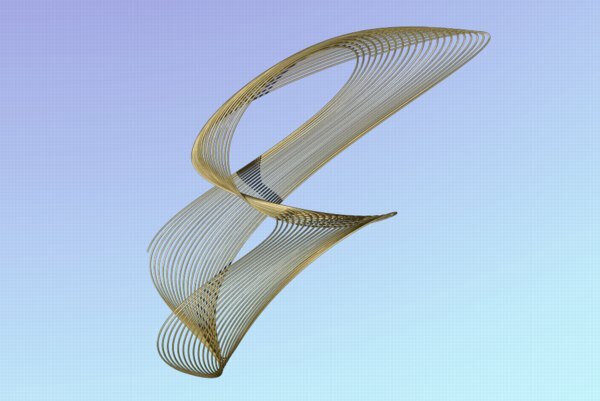 One way of generating Lissajous figures is via the coupling of two pendulums, in a device called a Harmonograph. Though it can be defined as simple harmonic motion, a Harmonogram could be interpreted as tracing an orbit around the centres of gravity of the pendulums, under the specific circumstances of phase and ratio. The variables underlying these forms can be imitated mathematically, to draw similar three-dimensional loops. It was the harmonograms that triggered my fascination with fluid surfaces, and the attempt of expressing the forms in metal, the medium I was used to. The connection to the dynamic principles active in the strange attractors proposed itself afterwards. The geometry of anticlastic curvature is directly related to non-planar minimal surfaces. Minimal surfaces occur naturally when a soap film spans a non-planar three-dimensional boundary. The surface tension seeks to minimise the energy required for maintaining itself and thus minimises the surface area. The mathematical interest is based on the special topological properties of such surfaces, and partially their economic elegance. I often found the boundaries of the mathematically rendered minimal surfaces to be rather restrictive and contrived, artificial - for they are still tied to x - y - z .. . and not an iteration - which is time-based and has a much more relaxed sense of origin (0,0,0), by referring back to the previous point rather than the orthogonal axes. .. (excuse this simplification - please send me an email if you can explain it . . .) ........ a thought on 'reference points' . . . I found that most minimal surface definitions are either simple and easily visualised without the computer, or very complex to the point where their mathematical definition is beyond my scope of understanding. The metaphor in this is that minimal, anticlastic surfaces embody the 'negative' curvature of hyperbolic space, which is a Non-Euclidean space, and is also the complementary principle to spherical form, which is the basis of 'volume'. The anticlastic surfaces occur in transitional phases, and are more open to change than the self-enclosed sphere. Similarly, the transitional sections, between attractors, in a dynamic diagram (phase portrait) are often such saddle shapes, where the movement of flow goes up in one plane, and down in the perpendicular plane. As such they could imply an opportunity for change, open to outside impressions but also indecision.